Those days that Murphy Law is so well known for. If anything can go wrong, it probably will. And oh, did it ever. Monday - Our fridge stopped working. This is the third time in eight months it took a mini sabbatical on us. I called our appliance guys out; a father and son team that feel it's necessary to argue in front of me and make me feel all kinds of uncomfortable every time they are in my presence. When Dad popped out to the truck, I mentioned to the son that my husband said we should try to put the hair dryer to the back as there is probably an ice build up when he totally interrupts me, puts his hands up and says, "No offence, but your husband doesn't know squat about refrigerators (!!!) and this is why we're here. Plus, that's only a temporary fix to a reoccurring issue". Um, okay. So my hubsy does know something then. Then he goes on to says, "I don't know why the last two fixes didn't take (although his Dad found out upon inspection during the last visit, Junior incorrectly wired up the thingamabob) so let's hope this works. I don't want your husband to think I'm here, trying to pick you up or date you!" EEWWWW. As if. An hour and a half later, $130 poorer, and completely disturbed, we're good to go. For now. Tuesday - The hottest day of the year. It's also the day my son decides it's crucial he learns how to operate the back door lock, just as I'm putting a dirty diaper in the pail around the back. Masters it on the first try aaaaaand locks me out of the house. I began to panic. Remembering the window around the house was unlocked, I grabbed a chair, sweat shooting like fireworks out of every pore in my body - no glistening here ladies - went through the window and fractured my pinky toe in the process. It's now in the purple stage and I still have a slight limp. Wednesday - I lost my wallet. After ripping the house apart for two days, I officially declared it missing. Crap. Cancelled my credit cards, debit card, and stressed about having to go through the hassle of getting them all reissued, especially the health cards, which is quite a process I'm told. I found it when I was talking the kids the park on Friday. It was in the wagon, under the blanket. A single tear escaped from my eye. I'm still waiting for the replacement cards and have missed a million and four sales in the meantime. Thursday - My laundry room flooded. As in flooded-into-the-family-room-and-saturated-the-carpet-so-now-it-smells-awful flood. Called out the plumber. 30 minutes and $225 later, a baby washcloth and a pair (A PAIR) of kids socks were the culprit for clogging the pipe. I have no idea how that happened and don't want to. Went to the bathroom to cry. Friday - Friday the 13th. Because I don't believe in superstitions and despite everything that happened, I was determined to make this a good day. I praised God for my health, my family, and all the blessings He continues to pour over me. I also begged for a stress-free day. My prayer was totally granted. It turned out to be the best day ever. Until yesterday when my sweet baby girl had a nasty fall on her bike and smashed up her face and forehead - just in time for photo day at school on Monday. *Sigh*. Click here for the recipe. This is one of my favorite pie dough recipes. The only change I make to the recipe is adding ½ cup of sugar to the dough. 2 cups Gala, Granny Smith or Cortland, or Empire Apples, peeled, cored, and diced. Combine first 6 ingredients to a mixing bowl and mix well, ensuring all apples pieces are coated; set aside. Preheat oven to 400º. Line 2 cookie sheets with parchment paper or silicone mats. Roll out chilled dough onto a floured surface. Using desired sized cutter (I used a wine glass to give you an idea of the size), cut out circles and place on cookie sheet. Spoon a generous amount of apple filling onto the dough. Place caramels and cream cheese over and round apples. Place a second piece of dough over the apples and crimp closed using the tines of a fork. Carefully cut vents into the top of pies with a sharp knife. This will prevent pies from getting soggy inside. Brush pie with egg wash and sprinkle sanding sugar on each. Remove from oven and transfer to a wire rack. Allow to cool before enjoying as filling will be hot. These are amazing served warm with vanilla ice cream. Good lord lady! Only rainbows and kittens for you this week. And these wee pies are gorgeous. Well done. Oh my goodness...you sure had a tough week! Baking (and consuming the delicious results) must be a lovely, soothing experience for you especially in such a hectic, stressful week. Here's hoping things smooth out calmly for you now! ;o) Yummy looking handpies! These look like the perfect pies to ward off any more bad luck! :) That is quite some week, and I am glad I am not the only one that has weeks like that...we all do. Hi! Those pies look absolutely amazing! Yum :) Just a quick question - there's no sugar in the original dough recipe, do you just add it in with the flour? Phewww, you had a rough week. 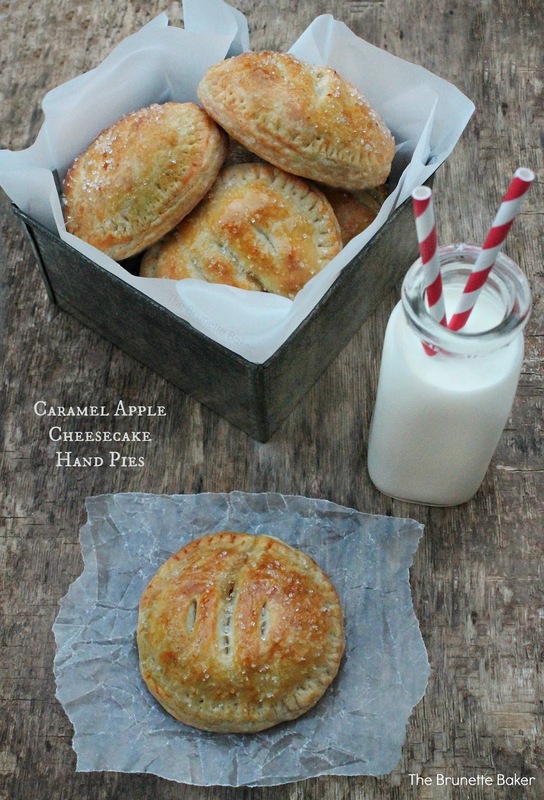 I'm glad you made these hand pies to help :). They look amazing! 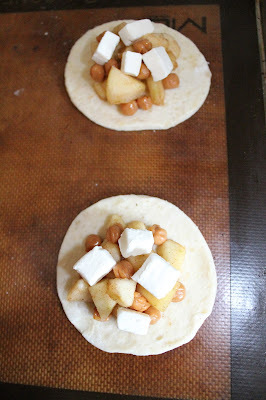 I am going to attempt to make these on the weekend. I will let you know how they turn out. I may mystery appear at your back door asking why don't mine look like the ones in your picture. Just letting you know.